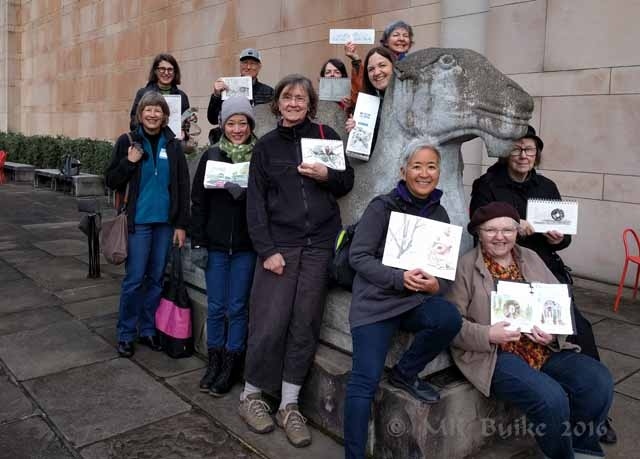 It was another Urban Sketcher Seattle Friday Ad Hoc outing today. We'd planned to go to the Volunteer Park Conservatory as it offered warm shelter from what was expected to be chilly rain. It was also a long way from any retail location on this Black Friday! But the weather was a beautiful, blue sky day, though still a bit chilly. 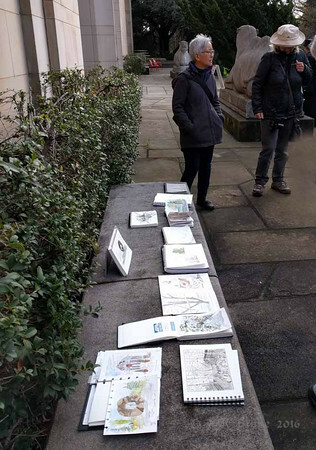 Some sketched in the Conservatory but others sketched outside in the park. I was among the latter group. 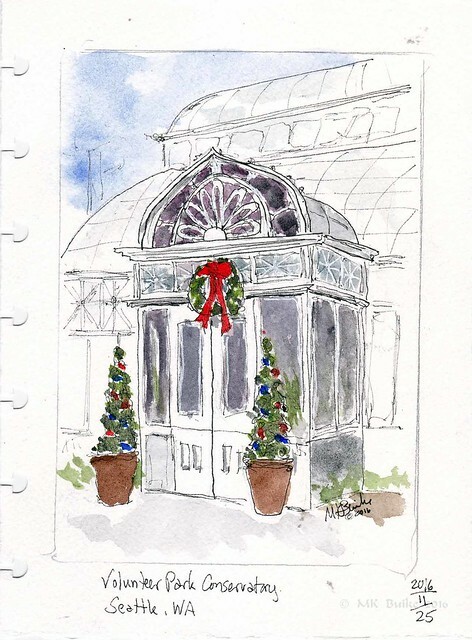 I first sketched the front door of the conservatory. I am always attracted to old fashioned architecture. (Arches paper; Daniel Smith Watercolors; Platinum Carbon Black ink in a Lamy Safari). 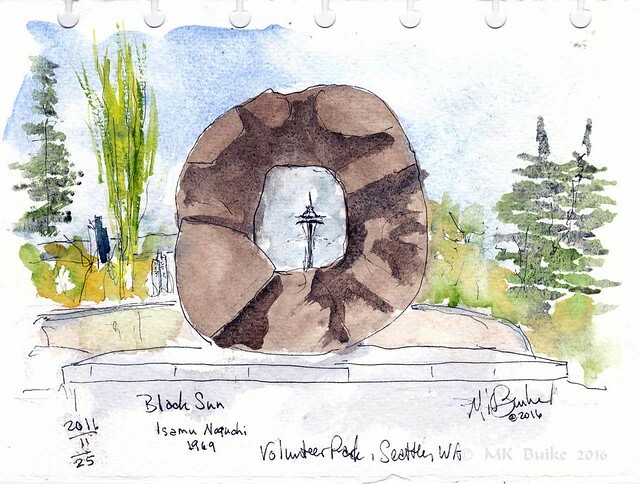 I remembered I've wanted to sketch the Black Sun sculpture so I walked over there next. I positioned myself so the Space Needle was visible in the opening! (Bockingford watercolor paper; Daniel Smith Watercolors; Platinum Carbon Black ink in a Lamy Safari). There was just a few minutes before we were to meet back up. 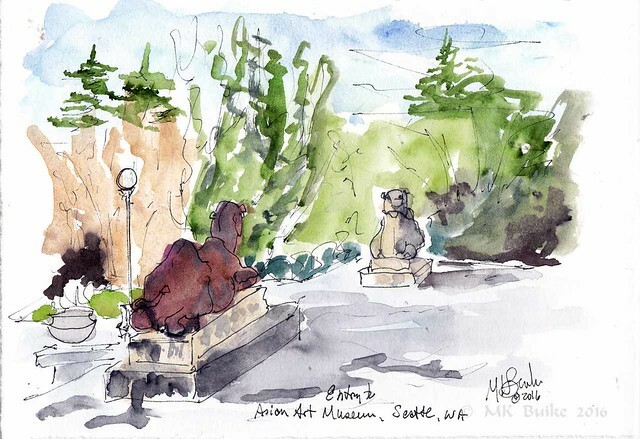 I did a 10 minute sketch of the sentry camel sculptures in front of the Asian Art Museum. (Strathmore Series 500 Mixed Media paper; Daniel Smith Watercolors; Platinum Carbon Black ink in a Lamy Safari). Thanks to John for the photo.